Gone are the days when the biggest invention on your suitcase was an extra compartment or a well designed key lock. Today we have “suitcases with brains” that make the old bizarre features look completely archaic. If you doubt it, imagine the experience of having a suitcase that also doubles up as a portable charging system for your devices, or even a motorized rider that gets you to the terminal as fast as possible. Stop imagining now because all these are features that actually exist. We are not kidding! Your suitcase can now be tracked and fully operated from your phone. Smart suitcases are, without a doubt, the best thing that has happened to travelers who wish to have a smooth experience while traveling. We did some research and here’s our compilation of some of the best smart suitcases you can buy before your next trip. You will love them! Let’s face it: it’s hard to find a suitcase that’s lightweight and at the same time sturdy enough to take any kind of beating. Boasting a strong outer shell and a large 328-liter capacity, the Away-Carry On suitcase will keep a week’s worth of clothing, including hard objects such as shoes, and serve you for years to come. But that’s not why it’s part of our list. The suitcase also features a number of compelling features that make it SMART! It comes with a built-in battery with 10,000 mAh of capacity and two USB ports to help you keep your devices juiced up! It’s also TSA approved and comes with a lock to keep your items safe. The Samsonite Geotrakr might look like your ordinary suitcase, but we can assure you that it’s not! It brings to the table smart features, most notably a Geo tracking device that lets you know exactly where your suitcase is at all times (even when it's stuck in another continent) via a simple app on your phone. 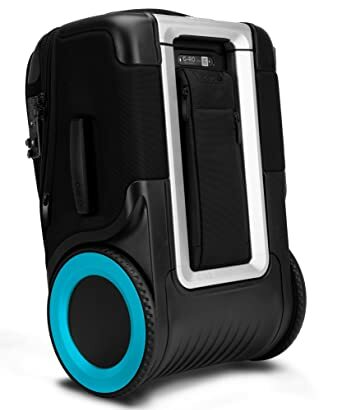 This smart suitcase also comes with a Triaxial Accelerometer that turns off automatically on takeoff and comes back on when you land to make sure its flight compliant. We can finally all say goodbye to broken suitcase wheels thanks to Travel–Light LTD's re-invention of the wheel. The G-RO 22 introduces easy to roll wheels that allow you to go through gravel, curbs, and cobblestone hassle-free. Talk about being convenient, this suitcase comes with a USB charging system that works on all electronic devices, letting you have a stress-free time at the airport. It comes with an exciting feature that balances the weight of your luggage making the suitcase feel lighter as you roll it. It’s definitely a dream come true for anyone who enjoys traveling light! The first feature that will surely catch your attention when you look at the Raden A22 is its sleek design. Boasting a perfect combination of the world’s best technology and the best material, this smart suitcase guarantees to elevate any travelers experience by far. It comes with a waterproof reversed zipper and sealing that is designed to keep your stuff safe no matter the condition. 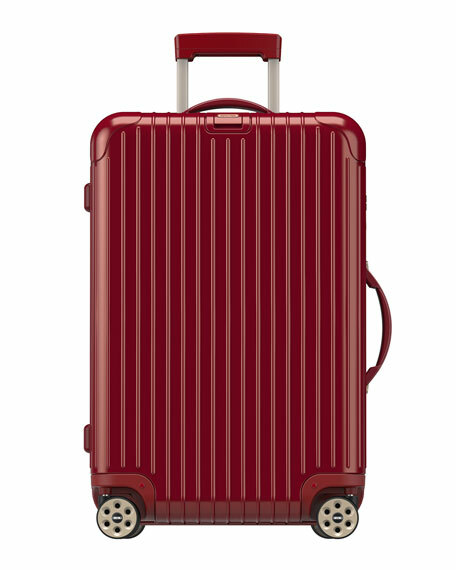 With Japanese designed spinner wheels that are unlike the old traditional suitcase wheels, you get a silent and smooth maneuvering experience. Its integrated electronic module offers up to 7800mAh battery capacity, meaning that you can charge your devices and complete your Candy Crush level while on the go. You will also appreciate the weight sensor that works by simply lifting the tip of the carry-on. When you get yourself the Delsey Pluggage Smart Luggage, you will realize that not all suitcases were born the same! 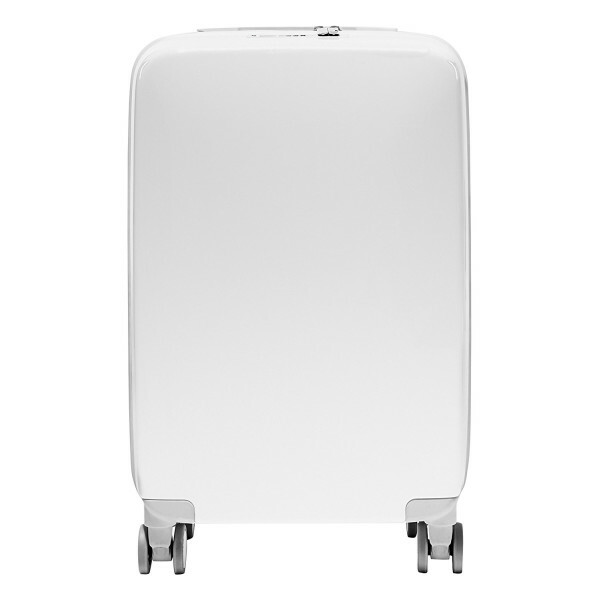 This one is packed with tech features that make it one of the smartest suitcases today! Apart from the basic features such as location and scale awareness and a built-in charging, you will also enjoy onboard detection – a feature that alerts you when the luggage is on the airplane – a strong built-in speaker and lit interior to help you find your items. This compact futuristic suitcase comes with a robotic biometric lock and a global tracker that leaves you with little to worry whenever you travel overseas. You can easily track it via your smartphone and determine exactly where it is. As if that is not enough, it also features a smart battery to allow you to charge your devices, an audio phone that is Bluetooth enabled, a digital weighing system, plus a fully functional diagnostic system that lets you have full control of your luggage from your phone. Designed and assembled in the USA, this carry-on is a travel companion that anyone would want to own. For almost a century, RIMOWA has been tried and tested in the language industry but not a single time has it ever disappointed its customers! The Salsa Electronic is a good example of what the brand is capable of. Firstly, this suitcase eliminates the need of zippers as it comes with a unique design that makes it easy to open and close. But that’s not the smart thing about it! It also features a fully integrated digital system including an electronic tag that lets you monitor your language from anywhere with the help of an app on your phone. It’s also lightweight and roomy enough to hold most of your stuff. If you have traveled a lot, you can agree with us that it can either be a joy or an outright pain! You get to the airport and are told to remove some of your stuff because the weight is above the limit, and even when you comply, you are met with a rude shock that your suitcase cannot be found upon reaching your destination. Well, this is why the Bluesmart One –Smart Luggage was built! This suitcase makes traveling a breeze thanks to its smart features. It does not just charge your devices but also connects to your iPhone or Android smartphone wirelessly, informing you just how much weight is in there. Amazing right? Well, there’s more; the carry-on bag also comes with a GPS tracker and its very own built-in weight sensor. You can now forget about losing your language or getting turned down at the airport for carrying too much stuff. One of the features that make the Trunkster standout from other smart suitcases is the fact that it is a roll top suitcase with no zippers. It also features USB ports to allow you to juice up your devices while on the go. 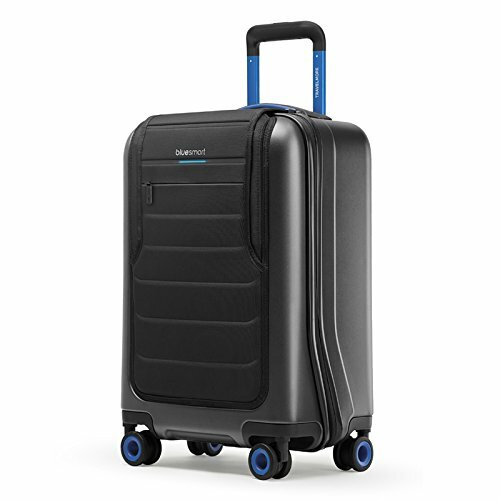 And just like other smart suitcases, the Trunkster Carry On incorporates a location tracker and a digital scale that makes traveling easy and so much fun. With a water-resistant durable design, you can be sure that this suitcase will handle whatever’s thrown its way. This is, without a doubt, the undisputed leader! If someone came to you a few years ago and told you a story about a suitcase that carries people at the airport, chances are you would just laugh and probably call them all crazy names! 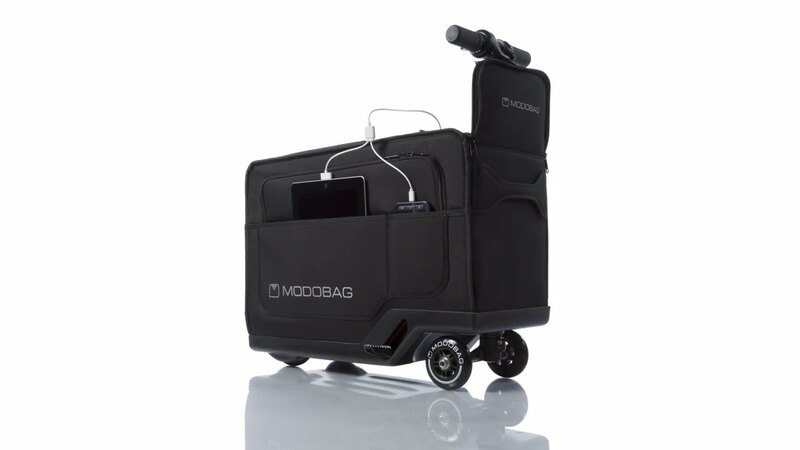 Well, Modobag has proven that this crazy idea can actually become a reality! Being the world’s first rideable luggage, the Modobag is a fun suitcase that allows you to get to your destination up to 3 times faster than walking. It has a smart punch to it thanks to an app that tracks the luggage and alerts you exactly where it is. If you want to make calls, chat or browse Facebook while on the go, you don’t need to carry your portable charger; the suitcase features USB ports that can charge a wide range of devices. Seriously, a suitcase can’t get any smarter!